Jypyä Pop (Turku, Finland) on 4 March 2019 in Lifestyle & Culture and Portfolio. Such a sense of freedom ! @Marjolein: Here was few weeks. Winter is not bad ! Don't come early, spring ! @Hiro: Okay, you are right. It is not good if the spring is coming too early..
Lovely. I see a couple of sticks. Hockey or Bandy? @beach: I think the rackets are props. The game is something we call "höntsä". The most important thing is to enjoy being outside. 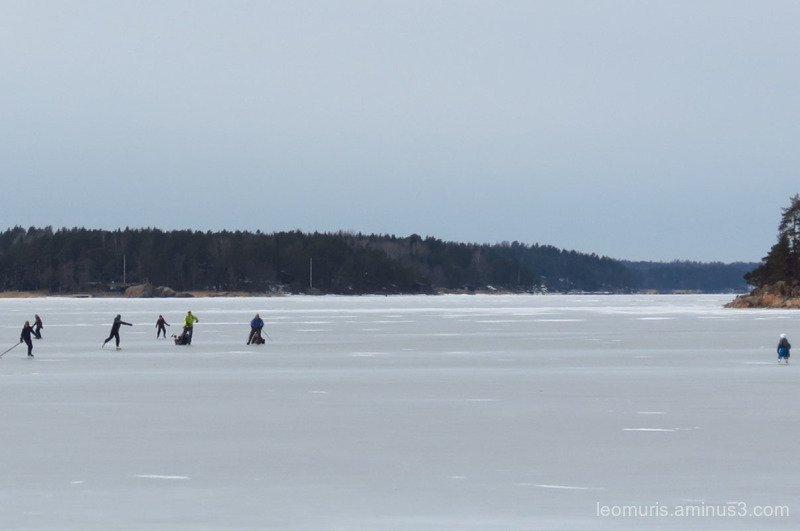 @Ruthiebear: This area of the picture is the Naantali winter hiking area. Here the fishing rod skates and walks. This looks like so much fun to skate outdoors. @B. Thomas: They enjoy the fun and enjoy the fresh air. All seasons, I think, are a great thing. Superb composition of the scene . That makes for one big ice rink!! Great capture! If only Lake Michigan froze, then I could have a huge rink as well. @Steven: You said that well. Here the sea freezes almost every winter. Une excellente activité sportive ! As long as the ice is thick, skate! A happy scene.